The colorful Ocean Sole images are not only great to see, the story behind the images is also inspiring and impressive. As soon as one hears which material has been used to make the images, one looks full of disbelief; flip flops (flip-flops) ?! Passionate about the oceans, sustainable and aware of the importance of ecosystems, Ocean Sole tackles pollution through flip-flops and other plastics. A large proportion of the world's population - particularly in developing countries - runs on foam foam (polyurethane) flip-flops. This footwear is cheap in purchase, but not durable in use. This, combined with an underdeveloped waste processing system, ensures that the flip flops in countries such as Kenya end up in nature and ultimately in the oceans. With all consequences for humans and animals. Waste that floats in the sea is carried away by sea currents and often stays behind in a place where these come together, this is called the 'Plastic Soup'. The Plastic Soup is a large 'island' of floating plastics that has formed in the oceans. Due to the salty seawater and ultraviolet light, this plastic slowly disintegrates into very fine pieces. Many of these small plastic particles end up in the stomachs of birds and sea animals via the food chain, resulting in poisoning and disturbance of the hormonal system in these animals. 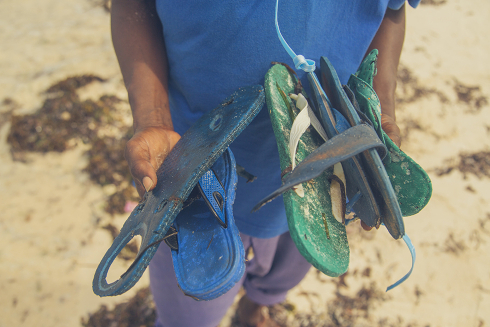 In addition, a large part of the Plastic Soup (including the flip flops) washes up on the beaches of Kenya. The washed-up flip-flops are collected and cleaned by employees of Ocean Sole. Subsequently, the flip flops are glued to large blocks, from which the creative team of artisans carves the most beautiful sculptures. Elephants, giraffes, lions, rhinos and many more well-known African savannah animals come to life from the flip-flops. Every Ocean Sole artist has his or her own specialism. For example, one artist is better at forming the smallest models, while the other ventures to the greatest creations! Ocean Sole contributes to a solution for three local and global issues that affect everyone: it prevents and remedies the pollution of land and sea by these plastics, it creates employment and the limited logging for works of art. Ocean Sole collects and processes around 750,000 flip flops every year. In addition, Ocean Sole creates more awareness among the local population by providing information about pollution, recycling and other recycling projects with the proceeds of the works of art. Ocean Sole creates employment. Kenya has the fourth highest unemployment rate in the world, about 40 percent of the population is unemployed. Of these, the vast majority are low- or unskilled and illiterate. In Nairobi alone, Ocean Sole has employed about 90 people. In addition, there is a large group of people who are paid for the collection of discarded flip flops. Ocean Sole reduces logging. Many of the artists who work for Ocean Sole come from tribes that are known for their carvings. The wooden images they produced were popular with tourists. By switching to flip-flops as basic material, the tropical hardwood shade is limited in Kenya. The artworks of Ocean Sole tell an important message about the importance of the protection of the marine environment and by their cheerful colors they simultaneously conjure a smile on the face of many people! The Plastic Soup is an island of floating plastics in the ocean with a size of 34 times the size of the Netherlands. Worldwide turnover of flip flops is estimated at as much as 15 billion, which is more than the entire market for sports shoes. With an average income of € 2 per day, flip flops are the only type of footwear that many people in developing countries can afford. Ocean Sole collects and processes around 750,000 flip flops every year.